← Nine weeks left, people!! Well, I am in week 33 and I can’t believe it is down to 7 weeks or less, or more. And for about half an hour yesterday, I thought it was going to be MUCH less than 7 weeks. Because of my age and my hypertension, I am now going to the doctor’s office twice a week for what they call a non-stress test. It is when I lay there for half an hour or so and they attach a fetal monitor to me and monitor the baby’s heartbeat. They are looking for the baby to move, the heartbeat to go up for a bit, and then to go back down. They want this to happen twice in twenty minutes. It prints out on this paper from the machine, and the doctor reads it when it is done and then I am on my merry way. Well, yesterday, they saw a few things that concerned them, and they couldn’t tell if it was the baby’s heartbeat dropping or the monitor was picking up my heart rate (which is about 55-60% of the baby’s heart rate). So, they sent me to the hospital to be monitored on their equipment for a longer period of time. By the time I got to the hospital I was FULL ON freaking out. I had no idea what the outcome would be, or what could possibly happen, and I was a mess. Thankfully, the nurse that took care of me was amazing. She told me not to freak out, and she would be the one to tell me one to start freaking out. So, after an hour and a half of monitoring, everything looked great, and Baby Allman was being super active. The nurse was pleased with the read out. The doctor on call would be there in an hour or so and wanted to do an ultrasound to check fluid levels before they released me, and everything turned out well, and we got a bonus picture of the baby where you can see it’s cheeks so clearly – he/she looks just like my husband! I was SO relieved, and SO tired after spending the day there. My mom came over and took the tags off of all of the clothes and stuff I have received so far at my first showers. And we started washing the stuff, and really getting stuff ready. 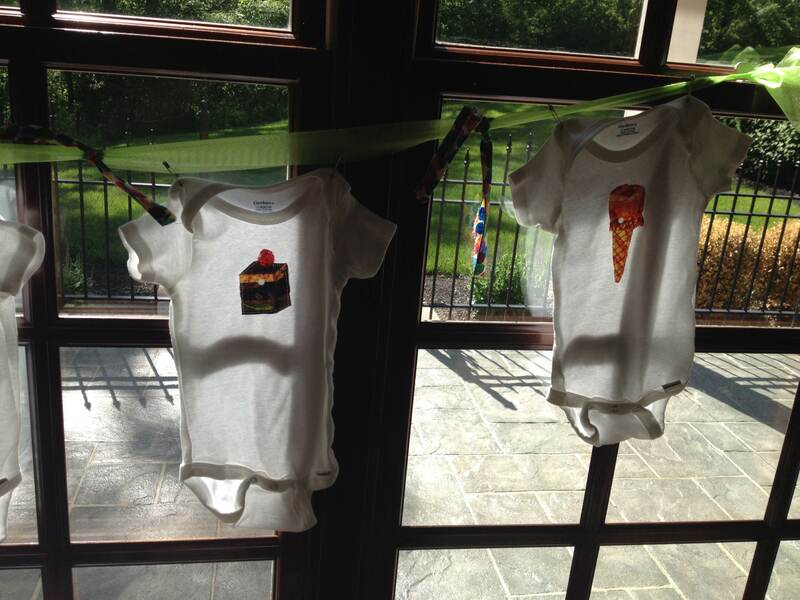 After that scare of possibly having to have the baby yesterday, we want to be prepared! Anyway, speaking of showers, I have had some AMAZING showers given by AMAZING people. On Mother’s Day weekend three of my best friends had a mother and daughter shower. It was a lovely day. The food was delicious, the company was amazing, and I was completely spoiled with gifts!!! 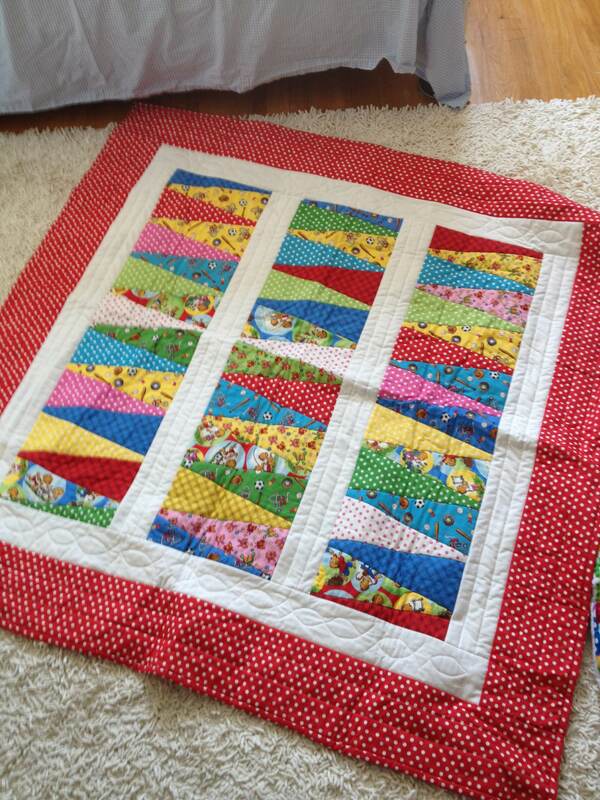 Here is one quilt made by my parent’s next door neighbor, who I refer to as my Irish mother-in-law. Her son and I were married in the high school marriage project, and our families are really like more like family than friends. We spend Thanksgiving with them every year, and many other family events through the year. 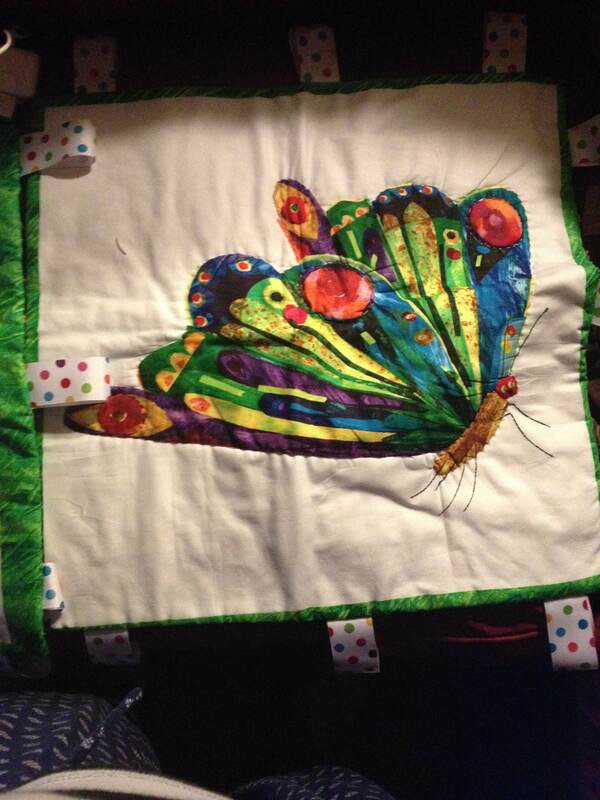 Another family friend and former neighbor made this Very Hungry Caterpillar quilt that is so soft and colorful! 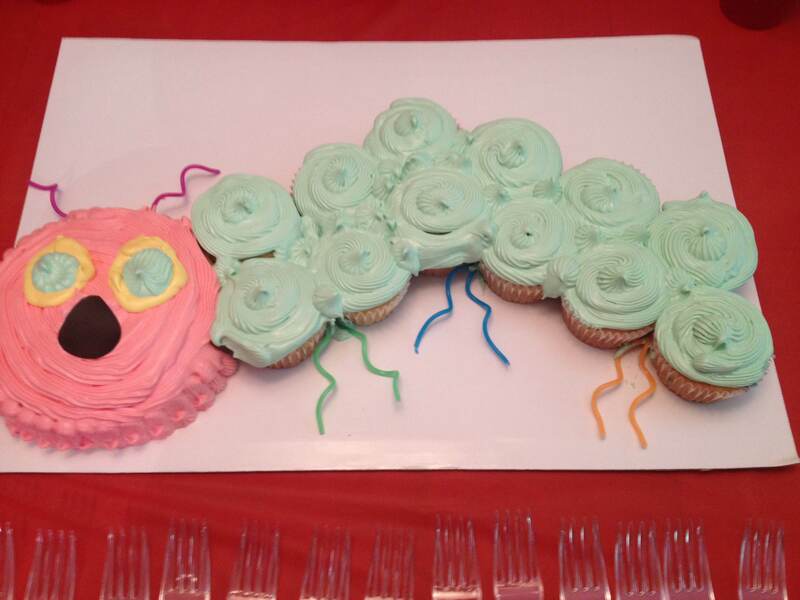 At the end of May, the teachers and staff had a shower for me that had so many creative, thoughtful touches. It as actually co-hosted by three people, one of them was a former student who I now teach with, one is Beth FS’s aunt, who works at my school, and the last was my 5th grade teacher, who also now works at my school. One of the things they had every body do was bring their favorite children’s book, which was very cool. I got some very awesome books that I LOVE. 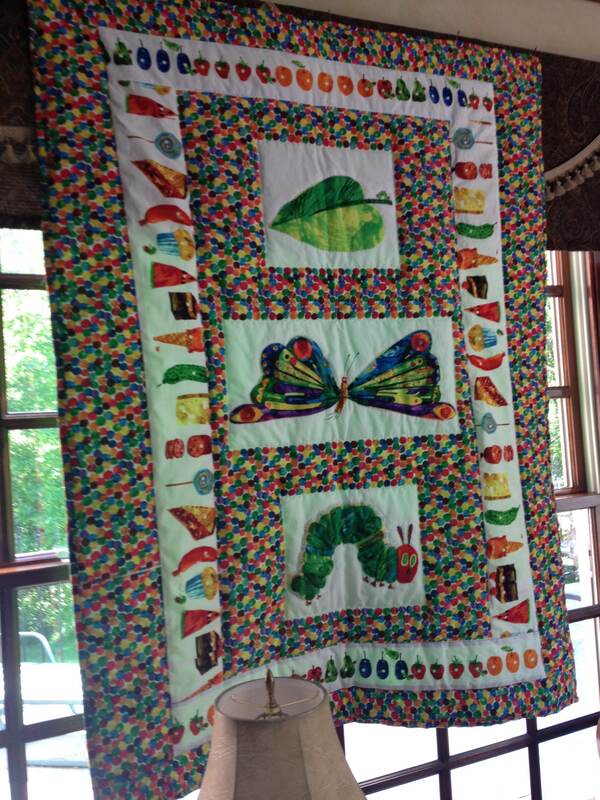 And, from my 5th grade teacher, I got this amazing homemade Very Hungry Caterpillar quilt, and on the onesies she sewed pieces of fruit from the story…. 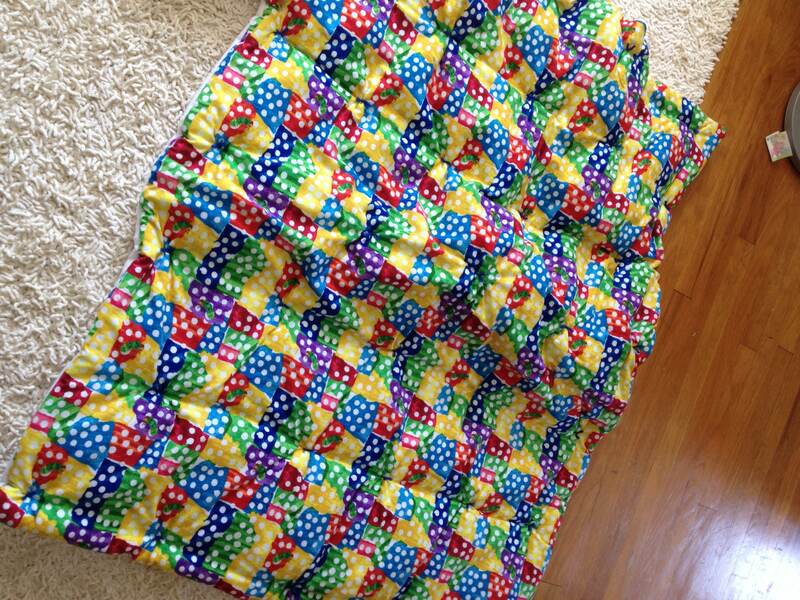 Then, I got these awesome tag blankets made my Beth FS’ aunt. 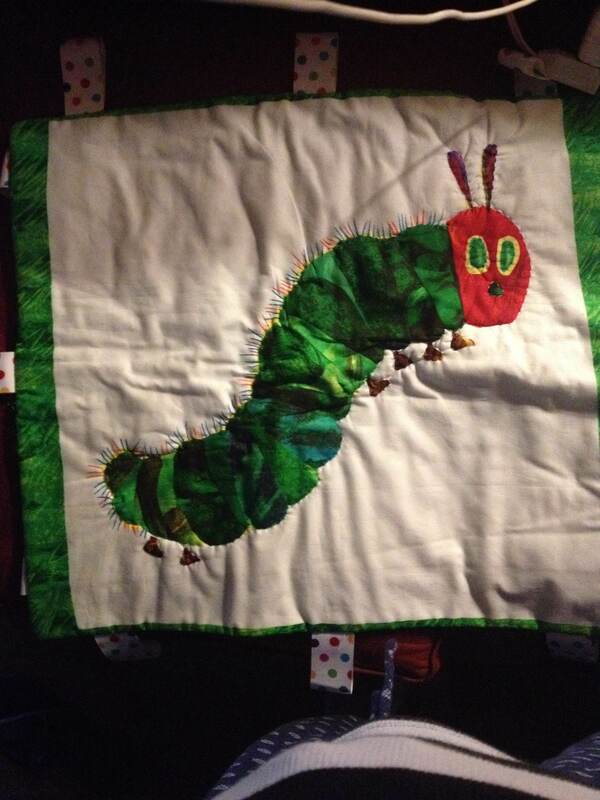 She also made this awesome caterpillar thing that you hang in the window. I don’t have a pic of it right now, but will post one when I do! I feel extremely blessed by people’s generosity and thoughtfulness. We have received so many nice things. And I still have my family shower in two weeks! I am VERY excited for that. After struggling with infertility for so long, and attending showers during that time, I just never thought it would be my turn. 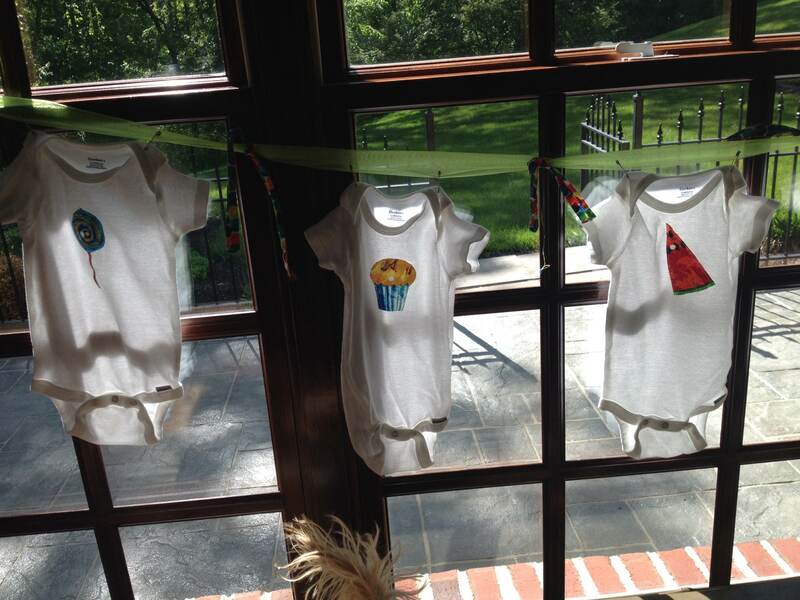 And I am so happy that it finally is…..
And I love spending time with my family! Well, I have one more work meeting in a few hours then I am officially on summer/maternity leave. WOO HOOO. 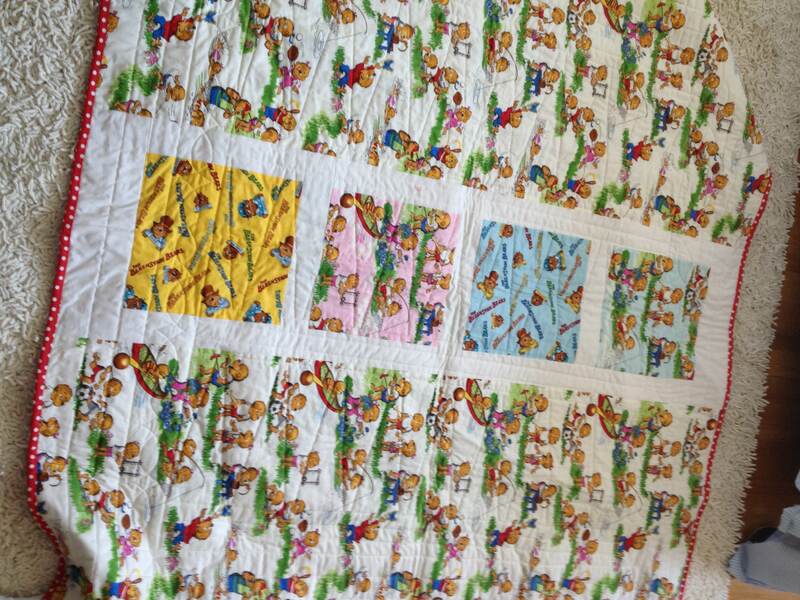 This entry was posted in Infertility, Pregnancy and tagged baby blankets, fetal monitor, nonstress test, quilts, very hungry caterpillar baby shower. Bookmark the permalink. 3 Responses to week 33. I can’t believe it is almost over, and you are HALF WAY there. Very exciting!!! And I feel very blessed/lucky to receive so many gifts. 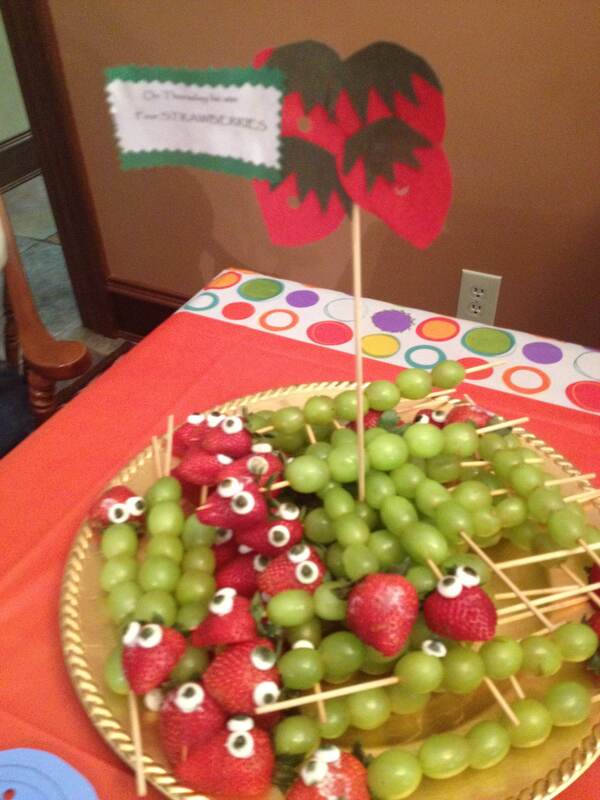 People have been so thoughtful and generous.